I remember Tab and thought it left a bitter aftertaste - yuck. The first diet soda I could tolerate was diet Dr Pepper. I remember it came in a blue can. 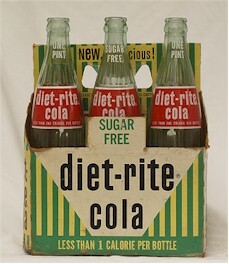 My grandmother kept Diet Rite and Tab on hand at all times in her refrigerator. Those were the good old days--circa 1968.